Medical properties: Stimulates liver and pancreas, stimulates growth hormone so is anti-aging, antirheumatic, antispasmodic, vasodilating, reduces blood sugar. Used for hypertension, hepatitis, accelerated aging. Dilute 50-50 with a carrier oil. Has been used in treatment of neuropathy (non-diabetic related), and blended with Spearmint essential oil for female hormonal balancing. The water-white to pale yellow colored oil presents a sweet-fresh-spicy basil-like top-note. The base-notes are winey-herbaceous and sweet like powdered Licorice. It also resembles Moroccan Chamomile with a Verbena freshness and an ethereal ambra-like undertone. It is used in perfumes, perhaps because of its complexity and amazing tenacity. The Oil Shop is one of the only suppliers of this oil. Beware buying foreign productions of this item. Although it grows in other temperate climates it is seldom commercially produced outside of the United States. Author and chemist Steffen Arctander warns that Erigeron oil sold in Europe is often adulterated. A little story from the Home Herbalist: The Atherton Tableland, Queensland, Australia, is a beautiful place. Some years ago my family and I lived there on a farm where a strong smelling weed grew prolifically. The smell was unpleasant to say the least but was mostly evident when the plant was handled or mowed. Apart from its nuisance value I didn’t take much notice of it until a local was visiting us; she told me it was called ‘stinking roger’ and it was a great herb for repelling fleas. So I stopped tossing the weeded plants on to the compost heap and began laying them where our dogs slept. I did notice later that there seemed to be no fleas around their bedding. While we lived there I continued using the plant as a natural flea repellent and the dogs were flea free. While I’ve never had the plant properly identified I do believe its botanical name is Tagetes minuta, a member of the daisy family (Asteraceae), which also includes Canadian fleabane. From a distance both plants look similar, so when I recently saw Canadian fleabane growing along a roadside I thought it was stinking roger. When I got closer I realized my mistake but it got me thinking about how Mother Nature provides so much for the survival and comfort of all creatures. Here we have two wild herbs that are members of the same family and both have insect repellent and medicinal properties yet they have naturalized in separate locations and in so doing provide benefits for any creature living in or passing through their location. Canadian fleabane’s reputation as a flea and other insect repellent has been known about for a long time. According to Culpeper, the juice of the plant destroys insects but they find the smell of the plant attractive and Mrs M Grieve states in her book, A Modern Herbal, that the smoke from burning fleabane repels insects including fleas. By 1994 scientific studies validated the plant’s use as an insecticide. Apart from its insect repelling properties fleabane is a medicinal herb with diuretic, carminative, astringent, and haemostatic (helps arrests the flow of blood) actions; its main application is in the treatment of kidney problems, respiratory infections, and diarrhea. Native to North America, Canadian fleabane has become widespread in other parts of the world including southeastern Australia. The American Indians introduced the herb’s medicinal virtues to the early settlers of the New World who spread the word about its benefits. Herbalist to King Charles 1 of England, John Parkinson, heard about the medicinal uses of the herb and in 1640 described it as a species of America. Interestingly, the herb was found growing in the botanical gardens of Paris in 1653. The only way fleabane’s presence could be explained was that it was introduced to the gardens by seeds that were attached to stuffed birds or beaver skins. It’s unclear how fleabane got its name; some think it was because of its tiny seeds that look like fleas and others think it’s because of the flea repelling oil it produces. Whatever its name there’s no doubt that it’s a valuable wild medicinal herb. Considered a weed rather than a herb, Canadian fleabane is an erect annual that grows to 2.2 metres tall. The stem rises from a clump of basal leaves that wilt later and alternate lance-shaped, dark green leaves have coarse white hairs, and margins that are occasionally toothed. Numerous tiny daisy-like white flowers appear throughout the year. 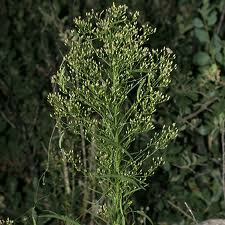 Side Effects Canadian fleabane (Conyza Canadensis) can cause dermatitis in sensitive people. The essential oil of stinking roger (Tagetes minuta) could be toxic so should only be used in moderation; it’s very phototoxic so avoid applying it to areas that would be exposed to sunlight otherwise cover the area or stay indoors for the period of use.